A cruise ship can be thought of as a floating community, supplying accommodations and services for thousands of passengers. Hundreds of positions are required to run a cruise ship. In a volatile economy where so many industries have an uncertain future, cruise ship jobs are on the rise. In the last four years, major cruise ship travel companies have doubled the size of their fleets. With the continued increase in the number of cruise ships currently under construction, the number of cruise ship jobs is projected to triple by the 2012. Working on a cruise ship offers many rewards. Employees can both earn and save a significant amount of money in a short amount of time. 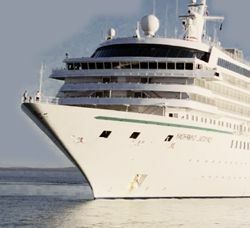 Many expenses are covered by the cruise line, such as: accommodation, airline tickets from the port of embarkation to your home airport, food, and medical care. Citizens of some countries are exempt from any taxes on income earned at sea, although there are tax calculators available that can assist anyone who is not exempt. On a cruise line, you have the opportunity to travel all around the globe, for free. Most cruise ship employees get to share the fun, as many cruise lines will offer employees discounted cruise rates for family members and relatives. Cruise ships hire employees year-round. Most cruise lines look for highly motivated, friendly, energetic, outgoing and professional employees. Displaying a strong commitment to providing excellent customer service excellence is a plus. Many entry level jobs on a cruise ship require nothing more advanced than a high school diploma. Because a cruise ship is all about luxury and relaxation, there will be job openings that more extravagant cater to the rich, like those found in five star hotels. Employment is usually handled with a contract. Employment contracts usually last from 3 to 9 months, and with an option to extend the contract period later. With such a wide variety of jobs on a cruise ship, it is highly probable that previous jobs experiences will be helpful and favorable for you on various cruise lines. For example, hospitality management and front desk clerks are sought after for crew members that will help ensure passenger satisfaction. Nearly all hospitality related or customer serviced focused jobs should provide you with enough experience, and make you a serious contender for hire at many different cruise ship positions.